Member of the European Tempus project ISLAH (Instruments to Support the Labor Market And Higher Education). Partner Universities: 7 Moroccan universities, 4 Tunisian universities, 2 European universities, French Centre for Research on Qualifications’ mission: CEREC (France) and the Interuniversity Consortium AlmaLaurea (Italy)), 2013-2016. 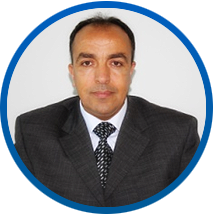 Member of the European Tempus project GRINSA (Inserting of laureates and evaluation, governance and management tools for higher education in Morocco). Partner Universities: 4 Moroccan universities, 2 European universities, Interuniversity Consortium AlmaLaurea (Italy), 2009-2012. Member of the Tempus project UM_JEP-32030-2004 (Implementation of training courses Policy, Strategies and information systems in QA at national level). Partner Universities: 2 Moroccan universities, 3 European universities, 2005-2009.